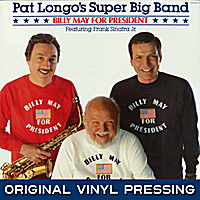 "Billy May For President" was recorded in November of 1984 at Capitol Records in the famed Studio A by Pat Longo's Super Big Band as a tribute to legendary arranger Billy May. The album also boasted vocal selections performed by Frank Sinatra, Jr. which were arranged by Billy May himself at the request of Longo. Billy May enthusiastically accepted the invite and was at the helm for the entire recording session. The album was produced by Mr. Lincoln Mayorga and features such famed instrumentalists as Kim Richmond, Bob Efford, Gordon Brisker, Buddy Childers, Bill Armstrong, Frank Szabo, Nat Pierce, Jerry McKenzie, Dave Stone and Tony Rizzi. The album contains music that is constantly exciting and extraordinarily melodic. This rare vinyl edition is from the original pressing and not a reissue!